WASHINGTON (AP) Without their usual offensive dominance at home and missing several key regulars, the Washington Capitals kept the puck almost all night and kept their home winning streak alive. Justin Williams and Tom Wilson scored and Braden Holtby made 30 saves as the Capitals beat the Edmonton Oilers 2-1 on Friday night to tie their franchise record with their 13th consecutive home victory. Washington’s run of scoring five-plus goals at home ended at 11, but in shutting down Connor McDavid and Co., the top team in the NHL showed it can win yet another way. Without injured defensemen Matt Niskanen and Brooks Orpik and forward T.J. Oshie, the Capitals handled the Oilers’ blazing speed with their most a href(equals)’https://apnews.com/1205a4b5bc0b4356938af43ce4bbd1db/Niskanen,-Orpik,-Oshie-miss-Capitals’-game-vs.-Oilers’patchwork lineup/a of the season. Evgeny Kuznetsov didn’t register a point but drew the matchup against McDavid and thrived as arguably the best player on the ice. McDavid had a secondary assist on Leon Draisaitl’s team-leading 23rd goal of the season to add to his league-leading point total of 69. The 20-year-old superstar had flashes of dominance but didn’t get enough time in the offensive zone to take over the game. Kuznetsov said he had some ”fun” matching up with McDavid and also fashioned some pretty plays in the offensive end. Fundamentally it was one of Washington’s better games in some time. 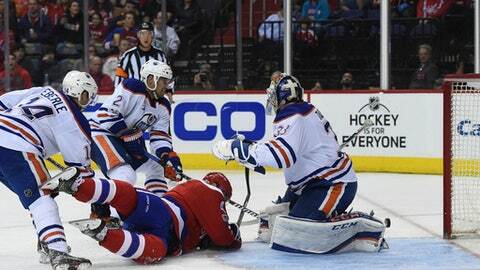 Edmonton made just enough mistakes to lose in what was a measuring stick game for a young team. The Oilers could take solace in the fact that they kept in close against the Capitals – something not many opponents have been able to accomplish in Washington lately. The Capitals have outscored opponents 64-20 during their home winning streak, haven’t lost at home in 2017 and turned Verizon Center into a mini house of horrors. Washington will again be without Niskanen, Orpik and Oshie on Saturday in Nashville, though Tuesday at the New York Rangers is a potential return date. The Capitals have been the healthiest team in the NHL this season with only 27 man games lost, but Holtby knew the injury bug would bite sooner or later. With rookie forward Riley Barber making his NHL debut, defenseman Aaron Ness his season debut and Brett Connolly moving up to the first line with Alex Ovechkin and Nicklas Backstrom, the Capitals showed they have the depth to withstand injuries. NOTES: Oilers goaltender Cam Talbot stopped 24 of 26 shots. … The Capitals improved to 35-4-4 when scoring first. … All-time leading scorer Wayne Gretzky was in attendance. Gretzky is vice chairman of Oilers Entertainment Group. … Edmonton D Darnell Nurse skated Friday morning but missed his 37th consecutive game with a lower-body injury. F Benoit Pouliot also skated but missed his sixth consecutive game with an undisclosed injury. … Barber’s debut came against the team that drafted his father, Don, in 1983. Oilers: Visit the Nashville Predators on Sunday. Capitals: Visit Nashville on Saturday.